I cannot walk without my shoes on, as I have a problem with my feet and have special insoles fitted in my shoes. I have a supply of disposable shoe covers, like the ones available at the Taj Mahal. If I covered my brown, non-leather shoes with these covers, would I be allowed to go into Hindu and Jain temples in India? 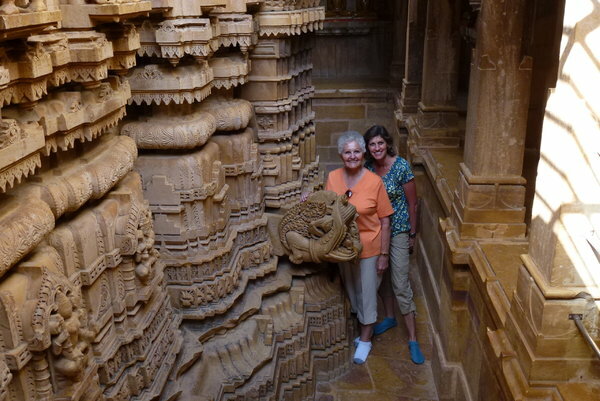 As far as Jain temples go, I think you're supposed to be totally barefoot, isn't it? Not even socks? I have never been into a Jain temple. In my albeit-limited experience, socks are not only allowed, but necessary, in some Hindu temples, due to the burning temperatures of the sun-soaked stone. Top Cat, might it be possible to wear your insoles inside socks? Can any of our regular temple goers think of any reason that might not be acceptable? You may not wear socks inside the main door of a Jain temple, that includes the perimeter within close walls used for circumambulation. I've had trouble on the hard floors myself - most recently in Girnarji where the dozen temples at the top of the hill are rather large and the marble floors caused my plantar fasciitis to kick up. If the temple is on a hill, and therefore, the hill itself is considered sacred, say for example Palitana or Shikharji, then wearing socks or non animal product shoes (canvas slip ons) is OK till you reach the main temple. Most devout Jains would do the climb to Shikharji (27 km round trip) or Girnarji barefoot though i wore simple non animal product shoes because i had foot problems back then (still do, actually). The thing about Jain temples is unlikely that any devotee is going to say anything to you, but it's just not done and a chowkidaar, if there is one, will certainly object. More detail on that device VA (from another sufferer).. This site has a photo of said device - http://theindependenttourist.net/tag/thar-desert/ in use inside Jaisalmer fort temples. I've pasted it below for convenience. I didn't use it in this temple - went barefoot since the part they're walking in is ''inside temple'' as far as I know. This, among-st other aberrations is why increasingly Jain temples segregate hours for devotees and tourists. So, if the OP is going to a well tourist-ed temple, he should be OK. Except I dont know where he's headed ? Thank you very much for your helpful replies. Do let us know about your experiences! Thank you for your helpful suggestion, I had not thought about trying the inserts in my socks. Yes it does work although not as comfortable as in my shoes. I can obviously go in Hindu temples, however the Jain temples will be my problem. I had planned to visit the Dilwara temples in Mount Abu, the Jain temples in Jaisalmer fort and the Nashiyan Jain temple in Ajmer, obviously I will have to forget about these. As Vaibhav Arora suggested, maybe you could go anyway. This would be during tourist hours (i.e. after noon). Just see at the door if there are many people going in with socks. If yes, you can join them. Thank you for your helpful suggestion, I had not thought about trying the inserts in my socks. Yes it does work although not as comfortable as in my shoes. Nice. it was just an idea, and I'm glad it might be useful. I think about socks and temples, because I got caught out, one day, with burning-hot stone, when taking a visitor around. I live here: I should know better, but I don't do that much temple visiting.